Ski Hill Road was a winding dirt road when the Breckenridge Ski Area started in 1961, rising steeply just a block west of Main Street. Before the road starts its accent and it’s first compensating switchback, the Ski Hill Condos sit, tucked into the forested lands at the bottom of Shock Hill. 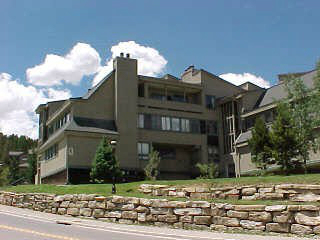 The Ski Hill condos for sale were extensively remodeled with new chimneys and exterior siding and the parking area was modernized in the mid 2000s. They each have balconies, and full length windowed doors onto them. The floor plans are open, and available Ski Hill condos for sales could vary from one to three bedrooms. Learn more about this convenient and quiet condominium complex, or discover thw available Ski Hill condominium listings below. The ski way from the mountain passes close to the Ski Hill condos on its way to the lower terminus of the gondola. Ski to gondola, or walk a block north to catch a ride up the mountain. The free town bus stops across the street in front of the town hall, and goes to all the mountain base, and even up Baldy Mountain for backcountry skiing. The short town trail called Pense Miller, starts outside the door of these condos and lead up Shock Hill and connects with other trails. The bike path can be found along the Blue River which parallels Main Street, and is on the Ski Hill side of Main. A heated pool and several hot tubs are located on site for the convenience of all homeowners. Size: 835 to 1540 sq. ft. Amenities: close to gondola, a block from Main Street, easy access via Park Avenue, covered parking, pool and hots tubs on site, storage. From the traffic circle on the north side of Breckenridge take the Park Avenue exit and continue .5 mile to the central intersection at Ski Hill Road. These condos are located here, on the northwest corner at 250 Ski Hill Road. Are you ready to explore your options at Ski Hill condos? Contact us today to talk to a Breckenridge real estate expert.